ore you have traction, investors will give you resources and time to figure it out. The implication is that startups selling clean energy systems and energy efficiency products are going after some tiny, lifestyle business market barely worthy of a Shark Tank episode. We have pitched A LOT of investors building SolarList and it is shockingly common to hear that solar is just too small of a market. “We’re used to hearing numbers with a B guys.” Initially we were dumb-founded, the opportunity of radically shifting our electricity consumption infrastructure feels so obviously enormous that we didn’t have an articulate response to why we were clearly going after something more ambitious than photo sharing, or photo sharing with an expiration date, or photo sharing with more filters or photo sharing using both the front AND, wait for it, the back camera (big markets folks). Total addressable market (TAM) to me consists of two parts. First what’s the raw total amount of money that is spent on your market. And second, for either structural or practical reasons, what slice of that market could you theoretically capture if you were wildly successful. For example, if you are building a flight search startup, you find that $XXXbn is spent on air travel every year. But you’re not building an airline, you’re building an app that will get paid a commission on every flight booked through it. So realistically your TAM is maybe 5% * $XXXbn. Maybe this is technically Serviceable Addressable Market, but whatever, this is the framework I’ll use below. Solar panels produce kilowatt-hours of electricity. Americans spend nearly $400 billion per year on kilowatt-hours of electricity. About $170 billion of that represents spending from houses and apartments, the rest coming from commercial and industrial sources. This is way more than the $135b spent on hotels and lodging. More than the $225b spent in the entire retail e-commerce market. Shockingly it is much more than the $165b that makes up ALL US advertising spend. Even if you limit yourself to only tackling residential electricity, you are still going after a market with the same sized pool of revenue that provides all the sales (or hypothetical future sales) for Google, Facebook, Twitter, Yahoo, Instagram, Pinterest, Snapchat et al. 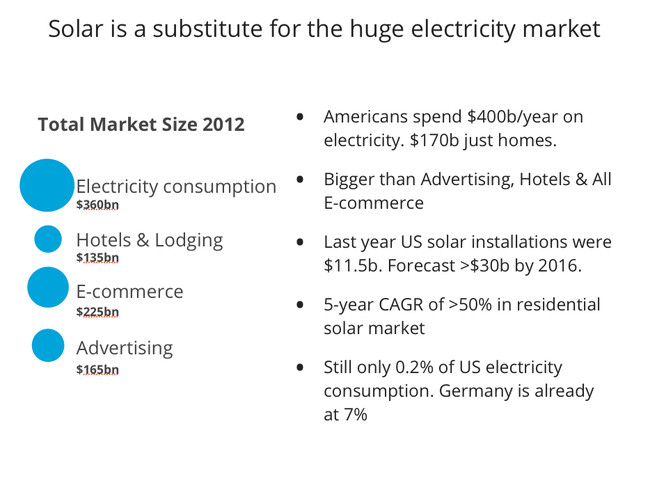 But, how much of of the market can solar take over? A Lot. And a lot more than you think is a lot. This is a question that skeptics have continually been proven massively wrong about. See The Economist’s excellent coverage of how European utilities wiped half a trillion euros from their market cap by underestimating the power of solar. Here is an awesome overview in very plain terms from Mark Jacobson of Stanford on how we could realistically switch to 100% clean energy. The expectation, and on some level fear, of a huge solar boom permeates the utility industry. The Edison Electric Institute, the trade group that represents all the electric utilities, which has historically down-played the future role of renewables, outlined in a recent report the probability of asolar viral loop, others have inverted it into the utility death spiral. Solar is a direct alternative to getting electricity from your utility. Each customer that leaves their utility for solar will slightly increase the cost to other utility customers, making them in turn more likely to switch to solar. Solar, it turns out, benefits from a network effect. Germany now gets 7% of its power from solar, most of which is owned by average citizens, and on sunny Summer days the German grid will sometimes be completely powered by solar. In 2012 in the US, solar represented just 0.2% of all electricity consumption. 35x less market penetration than Germany. The US electric grid is the world’s largest machine. It is old and dilapidated and the highly regulated, monopolistic nature of the utility industry means it has gone largely undisrupted for a century. Distributed solar represents a scaleable opportunity to capture entirely one of the largest slice’s of US spending ($400b) replacing it with a technology, that for millions of America homes means a cleaner electricity, a lower carbon footprint, a more resilient home AND savings that beat the return on your stock portfolio. It is not only a huge market, but very possibly the most prime startup opportunity on the planet right now. If you think more investors should be looking at the opportunity in clean energy it would mean a lot if you would recommend and share this post. This was originally posted on the SolarList Blog.